Dammed by the landslide, the Sun Koshi River breaks free. A landslide on August 2 blocked the Sun Koshi River in Nepal’s Himalayan foothills. After a heavy rainstorm this weekend the dam broke, causing minimal damage but reducing the flood risk. Click image to enlarge. A dam that formed last month following a massive landslide in Nepal’s Himalayan foothills gave way on Sunday, sending a torrent of water downstream. Though the flood washed away roads, houses, and excavating equipment being used to carve a drainage channel in the rubble, the damage could have been worse. Unexpected and unplanned, the dam breach may have a beneficial development, asserted Dave Petley, a landslide expert at Durham University, in a blog post. The roads were destroyed in the flood, called a bishyari in Nepali. The dam formed on August 2 when a 1.3-kilometer long landslide blocked the Sun Koshi River. The collapsing mountainside damaged a hydropower station, while burying the main highway to China with debris dozens of meters deep. The landslide, the deadliest in Nepal in a decade, killed 156 people. The Nepal Army had been working for more than one month to drain the three-kilometer (two-mile) lake that pooled behind the natural dam. According to field assessments by the International Center for Integrated Mountain Development, a Nepal research group, the lake was 48 meters (157 feet) at its deepest point. After the breach, the need to drain the lake is less urgent. Based on river-flow data, Petley wagers that a heavy rainstorm caused the lake to break through the natural dam. 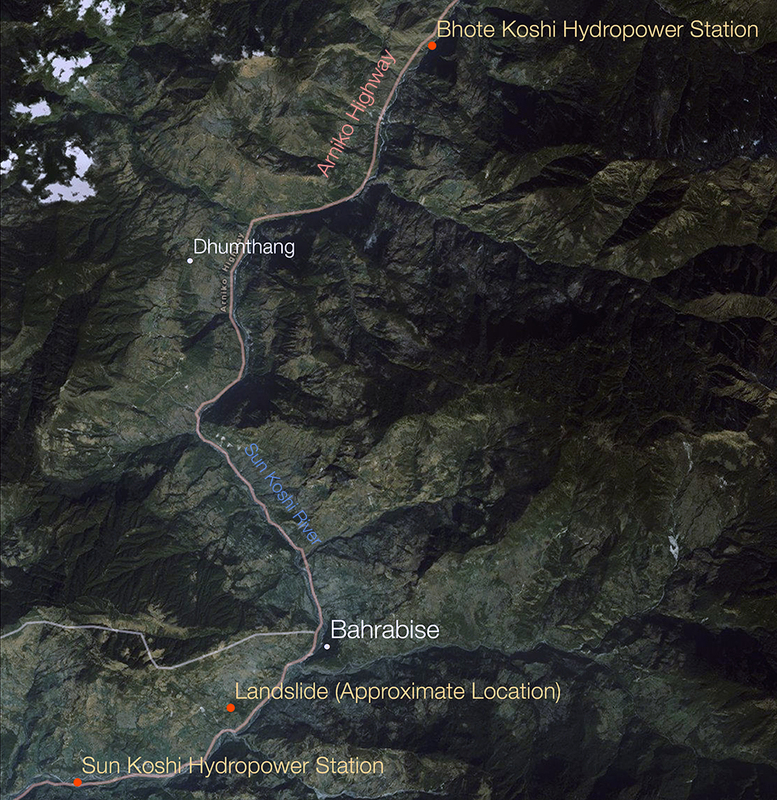 A local news agency reports that the breach lowered the lake level by 18 meters (59 feet) and that the Sun Koshi hydropower station was hit with boulders and rubble, but the extent of the damage to the station is not know. The Sun Koshi landslide led prominent voices in Nepal to call for a reassessment of the country’s desire for large hydropower dams that could be vulnerable to rainstorms expected to increase in intensity as the world warms. “Nepal is better off developing small hydropower plants across the country,” Dipak Gyawali told Circle of Blue. Gyawali was Nepal’s minister of water resources from 2002 to 2003. Similar disasters have occurred elsewhere along the world’s highest mountain range. Engulfing floods in June 2013 in the Indian state of Uttarakhand, just across Nepal’s western border, killed at least 6,000 people and mangled at least 10 hydropower stations. An expert commission charged with assessing the calamity ruled that hydropower development had exacerbated the damage. Piles of excavated sediment, pushed to the sides of river banks, became a cementing slurry, while rock debris turned into water-borne missiles in the tempestuous waters.